Eurypterus lacustris, (1:1) 13 cm. 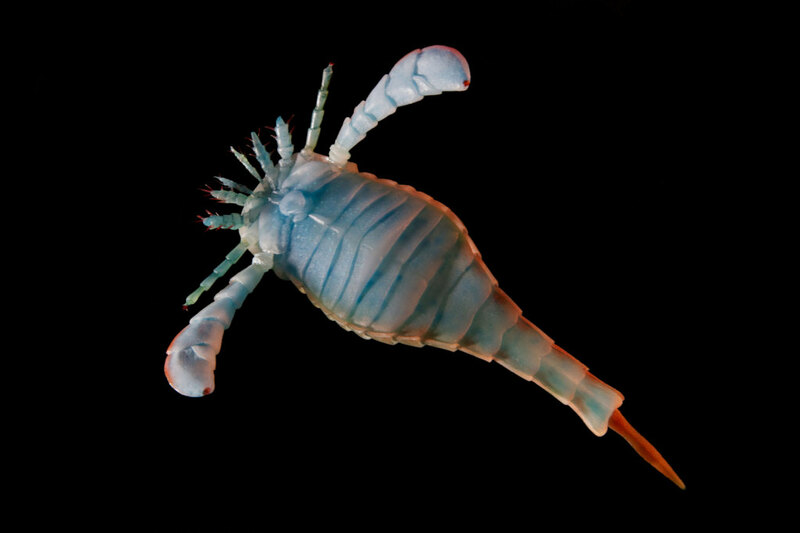 Eurypterids, often called sea scorpions, are an extinct group of arthropods that form the order Eurypterida. The earliest known eurypterids date to the Darriwilian stage of the Ordovician period 467.3 million years ago. The group is likely to have appeared first either during the Early Ordovician or Late Cambrian period. With approximately 250 species, the Eurypterida is the most diverse Paleozoic chelicerate order. That means they are the oldest scorpions we know of! 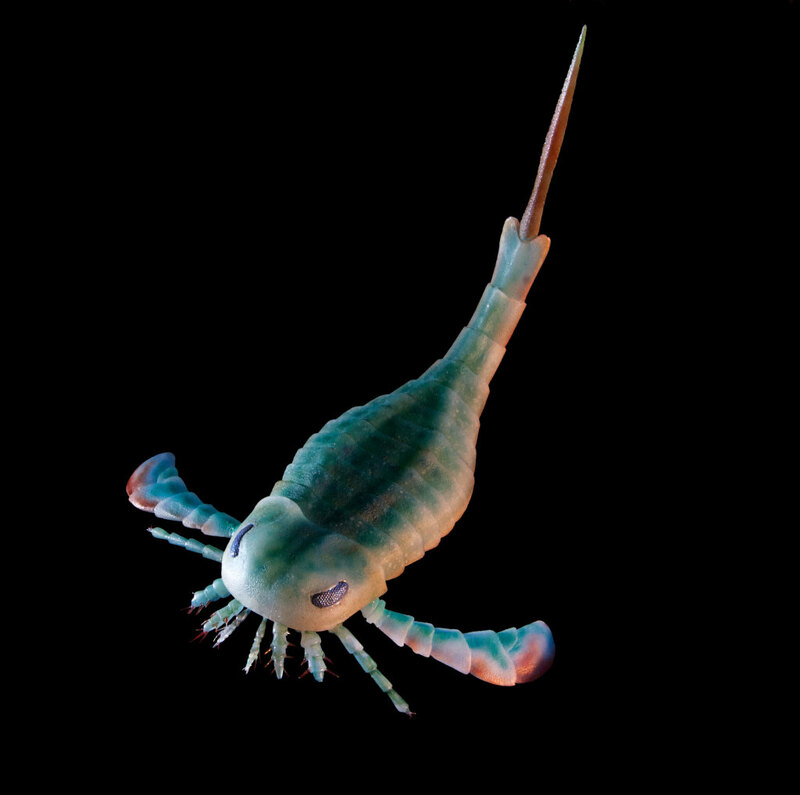 Following their appearance during the Ordovician, eurypterids became major components of marine faunas during the Silurian, from which the majority of eurypterid species have been described. The Silurian genus Eurypterus accounts for more than 90% of all known eurypterid specimens. 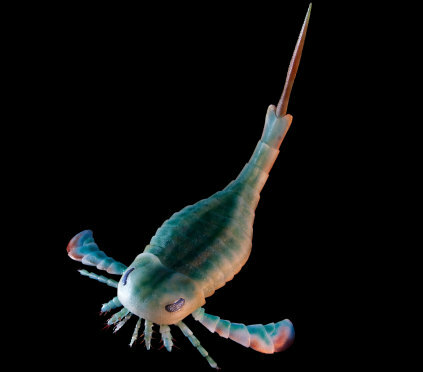 Though the group continued to diversify during the subsequent Devonian period, the eurypterids were heavily affected by the Late Devonian extinction event. They declined in numbers and diversity until becoming extinct during the Permian–Triassic extinction event (or sometime shortly before) 251.9 million years ago. The eurypterids include the largest known arthropods ever to have lived. The largest, Jaekelopterus, reached 2.5 meters in length. Eurypterids were not uniformly large and most species were less than 20 centimeters long; the smallest eurypterids, Alkenopterus and Eocarcinosoma, were only 3 centimeters long. Eurypterid fossils have been recovered from every continent. A majority of fossils are from fossil sites in North America and Europe because the group lived primarily in the waters around and within the ancient supercontinent of Euramerica.